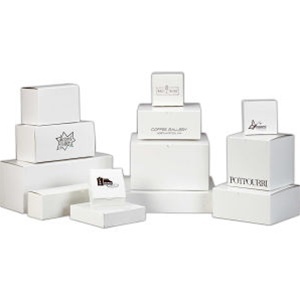 Our 1-piece semi-automatic solid white gloss gift boxes are made in the USA. This product line is made from 100% recycled materials and contains 50% post consumer materials. Each box has a tuck top lid with a lock bottom and is FDA compliant. Each box has a high gloss exterior finish with a white matte interior. Perfect size for ornaments, mugs, novelties, small trinkets or candy samples.